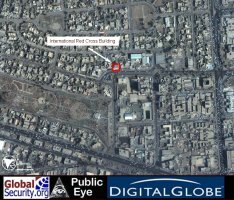 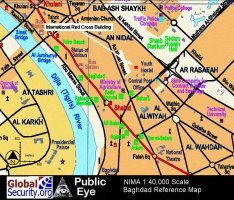 At approximately 8:30am on October 27, 2003, the International Committee of the Red Cross headquarters in Central Baghdad was struck as one of a series of four car bomb attacks that disrupted the first morning of the Muslim holy month of Ramadan. 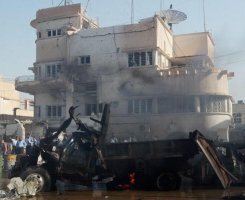 At least 35 people were killed and 230 wounded in the series of attacks, 12 of the casualties occuring at the Red Cross site. 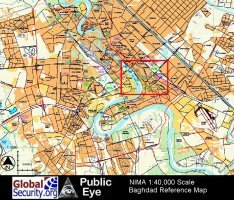 The explosions appeared to be coordinated, all four occuring within the space of 45 minutes at dispersed locations across Baghdad. 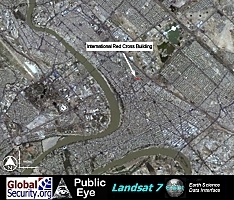 Landsat overview of Central Baghdad Digital Globe satellite imagery as of November 03, 2002, showing the Baghdad ICRC located at the elbow of a large intersection and close to two major roads: Muthana Al-Shabani and An Nidal.